We usually think that snacking is bad for us. But when it comes to fitness, the ‘bite-sized’ chunk approach has some real benefits. So if a busy schedule is preventing you from exercising, here’s a potential solution. According to a new study, as little as 3 daily sessions of 20 second bursts of high intensity exercise may be enough to improve aerobic fitness. WHY ISN’T MY USUAL HIIT WOROUT GOOD ENOUGH? The massive rise in popularity of short, intense workouts is due partly to increased time constraints on many people. There’s also loads of health benefits of High Intensity Interval Training, which might include exercises such as intervals of pedaling on a bike hard for 20 seconds followed by resting. The problem is that these brief HIIT workouts often still require a change of clothes and location. Exercise scientists have worked hard to find short, simple, convenient HIIT workouts that people really have no excuse to avoid, however busy they are. Finally it seems they have found the answer – stair climbing! 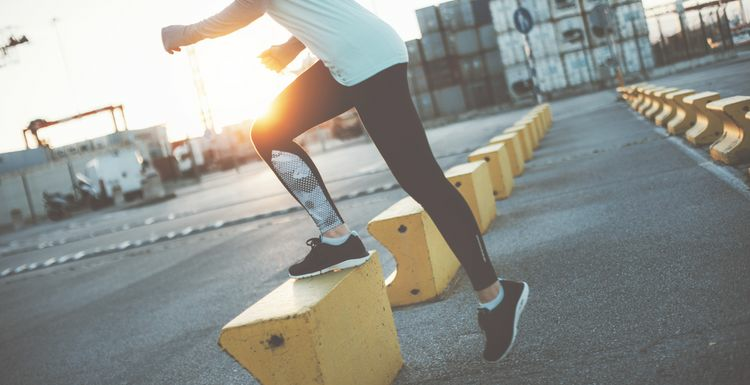 According to the new study, published this month in Applied Physiology, Nutrition and Metabolism, quick stair climbing, broken down into mini time-chunks, is an effective cardio workout. 24 normally inactive students were recruited to hurry quickly up 60 steps – 3 flights of steps – in the research building. This took about 20 seconds. That was the workout. This was repeated twice more each day, leaving several hours between climbs, amounting to 60 seconds total. This was continued for six weeks. The results showed the students raised their aerobic fitness by 5 percent, and also improved their leg power. GREAT! DOES THAT MEAN I SHOULD DITCH MY OTHER WORKOUTS? Certainly not. This brief type of exercise isn’t meant to replace longer workouts which have many proven health benefits. You would also miss out on the undeniable feel-good factor of a decent workout. But these ‘quickie’ stair-climbs are a great way for people who think they are too busy to exercise to fit activity into their day and experience fitness improvements. After all, who can’t spare 20 seconds? This really highlights the positive attitude of 'every little counts'. You really can start with 20 seconds, and build from there. No excuses nowadays with all this research showing even the tiny bits of movement helps. fit in 60 seconds? Can't hurt to try. Save the planet, don't use the lift! The thing is, stair climbing may be beneficial but it's simply not the same as giving yourself a decent hour off everything else to go to the gym, workout, change, shower, maybe have a relaxing drink after. It's the whole package that I'd miss, not just the exercise benefits. I think most people have cottoned onto the fact that stairs are healthier than the lift as in my workplace you rarely see people using the lift now, although it's only up 4 floors. I think I will start hurrying up them now!